Signature Heights is the brand new pioneering creation, located at an excellent locality of Kolkata which is much far from the hasty tones and fuzziness of the city. 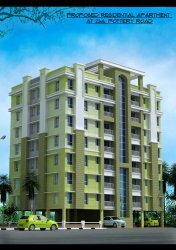 For the newer looking branded royal homes, this extraordinary residential project offers, 3BHK apartment in a sprawling land with extensive greenflies around. With bizarre hi-tech specifications of quality construction and architectural designs, you can be sure of loving the place where you would see your bright future.